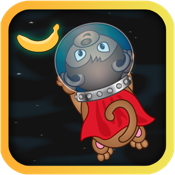 Space Monkey is lost in space! Help him Dodge asteroids, aliens, and space grenades to stay alive! A terrible accident has left Space Monkey lost in space and separated from his ship. Your mission is to help Space Monkey avoid the dangers of the galaxy. Help him to avoid deadly asteroids, aliens, and destructive space grenades. Collect radioactive bananas to eat for a boost in energy! Use the accelerometer to dodge the obstacles in your way and navigate to collect the radioactive bananas!